Miss Beauty Saver // A British Makeup and Beauty Blog: W7 Bali Lip & Cheek Stain Review: A Benetint Dupe? 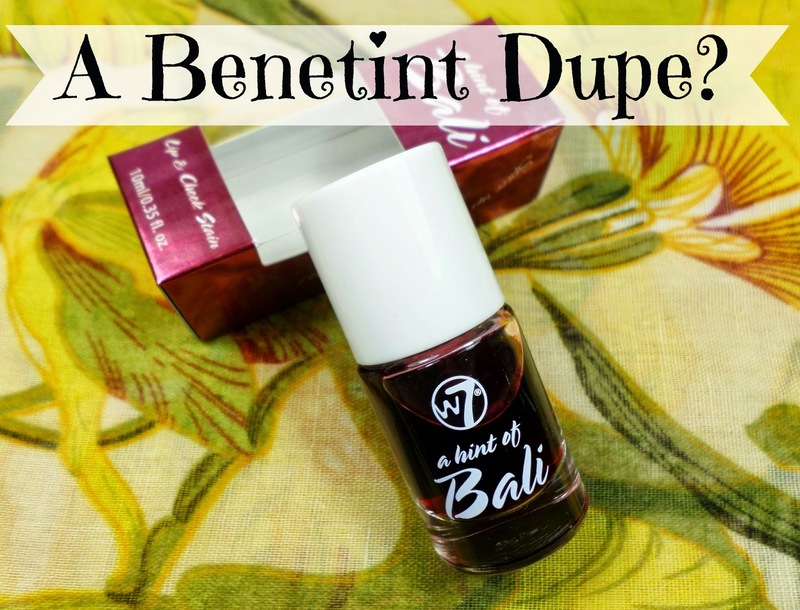 W7 Bali Lip & Cheek Stain Review: A Benetint Dupe? Benefit's Benetint Lip and Cheek Stain is probably regarded by many as the best lip and cheek stain around but it's certainly not the cheapest at £24.50 for 12.5 ml! Today, I have a wonderful Benetint dupe from cheap makeup brand W7 that's a bargain at only £3.49 for 10ml. The W7 A Hint of Bali Lip & Cheek Stain gives skin a healthy glow and adds slight hint of tint to the lips with it's timeless rosy red colour. 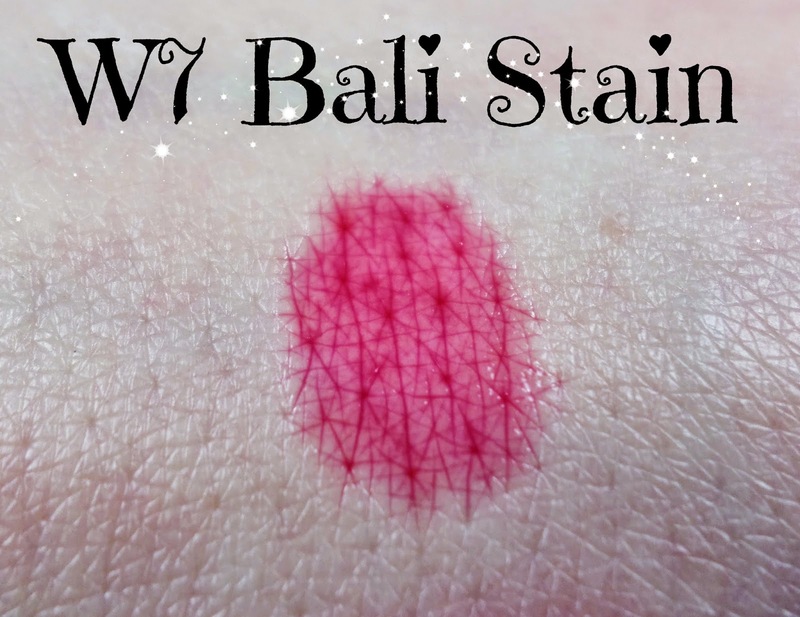 W7 A Hint Of Bali Lip & Cheek Stain Swathes - The Best Cheek & Lip Stain? This is a dual purpose product as it can be used as a liquid blush and a liquid lip stain. Since my makeup bag is full to bursting already, I appreciate the dual functionality of this lip and cheek stain as it's effectively two products in one. As a lip stain, this works well as a long lasting and natural looking, barely there lip colour. I like to wear this on minimal makeup days were I don't want to have to top up my lipstick every 2 hours! As a cheek stain, it's easy to apply with the built in brush applicator. Like most cheek stains, after applying, it needs to be blended out immediately with a fingertip using a gentle dabbing motions before it dries down to a long lasting finish. Liquid blushers like this have a reputation for being difficult to work with but I've found it just takes a little practice, especially if you're not used to using liquid cheek stains. One thing I did find out the hard way is that it's important to apply this before any powder as otherwise the powder will go patchy! I also like to apply this as a base for my powder blusher on those full makeup days. This is one of the best liquid lip and cheek stains I've ever tried and I'm always happy to find good quality, on trend cheap makeup. It's an ideal makeup staple for summer and because it's a stain, it should hold up pretty well even in the hot and sunny climate that we should have here in the UK soon! What's the best lip and cheek stain you've tried? All opinions are honest and 100% my own, as always!